Welcome to the Iris & Lily store! We're so glad you stopped by! Please take a look around and then let us know if you have any questions. We are happy to offer you personal assistance. Best books I’ve read in… forever! I want to read them again! A story of sisters and family!! "I could not put this book down!! An emotional ride!!" "One of my favorite books of all time...poignant and raw yet also sweet and loving." "Loved the three book series… Now our book club is reading the trilogy so we can discuss the women's issues addressed in the novel." Best book ever in my opinion. Very captivating, and I did not want it to end! "Best book I have read in a long while! The authors described people, places, & events so well - draws the reader right in. I didn't want this book to end!" I miss Lily & Iris! "This very authentic tale of two sisters growing up in a large family took me on an emotional rollercoaster ride. I found myself wanting more…"
"Iris and Lily became like a part of my family as I read this book. I laughed and cried and thought about the story when I was busy doing other things." "I laughed, I cried, I empathised. First I was Iris then lily then Iris.......over and again. The insight into family dynamics is soul wrenching." We know how it is. You like to hold your books in your hands. The trade paperback format gives you something to grab onto, as Iris & Lily take hold of your heart. Click here to order the 3-volume set and save even more! Oh yes! And every shipment from our store includes a extra surprise inside-just like your favorite childhood cereal! including ebooks and audio books! Buy all three volumes and save! Enjoy a discount when you purchase all three volumes of the Iris & Lily series at one time. A $45.00 value! You don't want to be left hanging when you turn the last page of each volume, do you? More beautiful Iris & Lily gift items - for you and the book lovers in your life! This beautiful mug displays the cover art from the Iris & Lily novel series. An original work of art by Milanese painter Pietro Spica, this mug is the perfect companion to the Iris & Lily books - and perfect for a luxurious afternoon sipping your favorite drink and indulging in a delicious story. A gorgeous gift for yourself or the book lover in your life. This lovely companion journal is a place for you to record your own thoughts, feelings, and discoveries as you travel the path of healing and growth with Iris and Lily. This beautiful spiral bound journal comes complete with the authors’ best tips on how to get the most out of your journal-writing practice. Purchase ebooks and audio books directly from our partners below. You want to take your library with you wherever you go. We get it. 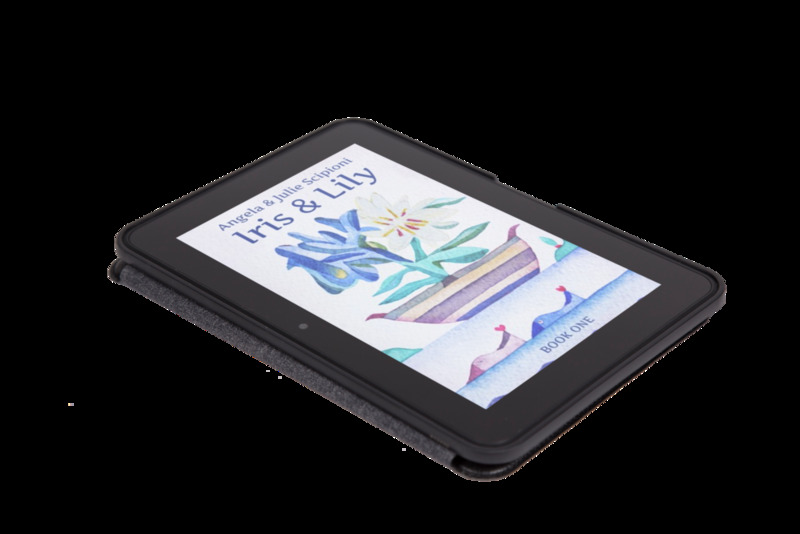 The ebook format enables you to continue your Iris & Lily experience wherever and whenever the opportunity arises! Plus, with the Complete Series ebook, you get the convenience and value of all three books in the series rolled into one. Who has time to read?! No matter how hectic your schedule is, you can enjoy the Iris & Lily audio books in the car, in the air, or with eyes closed relaxing in front of the fire. Sign up for a one-month trial on Audible and receive your first audio book free!